Millet Apple Raisin Cake is easy to make, gluten-free, and also featured on the Whole Grains Council website. 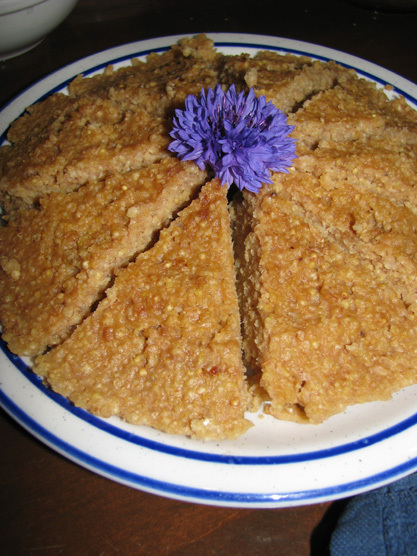 Millet is a naturally sweet grain, and after cooking it sets up and is slice-able. My daughter Emily loved this healthful and easy cake as a child and still does 20 years later. 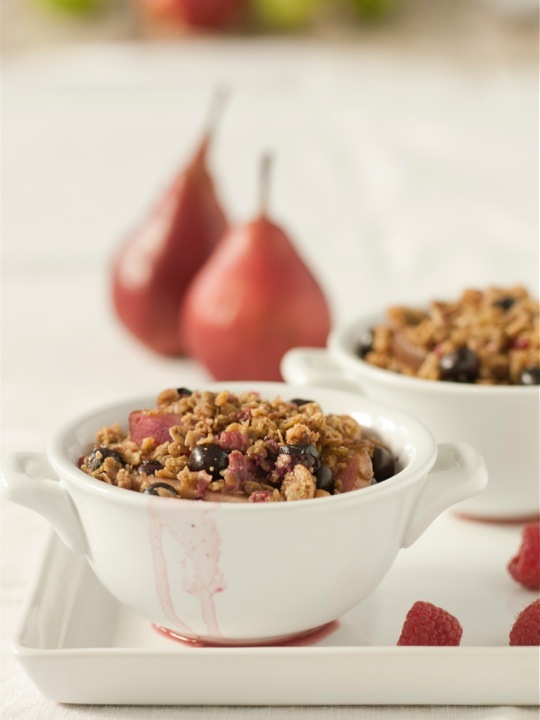 This entry was posted in Desserts, Recipes and tagged apple, Gluten-Free Cake, leslie cerier, millet, raisin, Vegan, Whole Grains Council on 11/25/2010 by Leslie Cerier. Here are some remarkably delicious recipes from Leslie Cerier‘s Gluten-Free Recipes for the Conscious Cook. Also you will be able to listen to an interview with The Natural Counselor, Irina Wardas HHC AADP, Women’s Holistic Health, Nutrition and Relationship Expert. You will learn what is gluten, what grains are gluten-free, how quick and easy it is to open up a world of health eating pleasure; eat a high fiber, mineral and vitamin rich gluten-free diet, and lots more. The cooked butternut squash practically melts to form a sweet sauce in this warming stew. If you use soy-rice tempeh, the dish offers complete protein; or you can just serve it over cooked millet or rice. Chickpea miso is especially complementary to the flavors of this stew, but you can substitute other gluten-free varieties if you like; hearty brown rice, adzuki bean, or millet miso would all be good choices. You can use either red or white wine in this dish—or any other wine for that matter. I recommend using whatever wine you’d like to drink with the stew. For a special treat, try pear or peach wine. Soak the shiitake mushrooms in the wine for about 15 minutes, until they soften. Heat the oil in a soup pot over medium heat. Add the tempeh and cook, stirring occasionally, for 5 to 10 minutes, until golden brown. Add the squash, potatoes, water, wine, and mushrooms. (You may want cut the mushrooms into bite-size pieces or at least halve larger mushrooms.) Bring to a boil, then lower the heat, cover, and simmer for about 20 minutes, until the potatoes are tender and the butternut squash is melting into the pot. Stir the miso and mustard into some of the hot broth, then stir the mixture back into the stew, along with the rosemary, thyme, and sage. Millet is a naturally sweet grain, and after cooking, it sets up and is sliceable. My daughter Emily loved this cake as a child—still does twenty years later. Not only is it quick and easy to make, it’s extremely healthful. In fact, you need not enjoy it just for dessert; instead of pouring it into a pan to set up, you can eat it hot, as a porridge. And as you can see from the variations below, it’s also a very versatile dish. Experiment and tweak it to your liking! Combine the millet, juice, raisins, and salt in a medium-size saucepan over high heat. Bring to a boil, then lower heat, cover, and simmer for about 20 minutes, until all of the juice is absorbed and the millet is tender. Give it a stir, and then taste it; if the millet is still crunchy, add more juice, cover, and simmer for about 3 minutes, then check the tenderness again. Pour the mixture into a standard loaf pan and let it cool for about 1 hour, until set. Slice and serve. Store any leftovers in the refrigerator. Use a combination of other fresh or dried fruits, such as pears, apples, or apricots. Small fruits are fine as is, but you may want to chop fruits that come in larger pieces. Stir in about 1 teaspoon of ground cinnamon or vanilla extract before pouring the batter into the loaf pan. Use corn grits in place of some or all of the millet. To use a pressure cooker, just put all of the ingredients in the pressure cooker and lock the lid. Bring up to pressure over high heat, then adjust the heat to maintain pressure and cook for 15 minutes. This entry was posted in Interviews and tagged apple, Butternut Squash, Desserts, Gluten-free, Healthy, Healthy Eating Pleasure, Holiday Dining, Holiday Gluten-Free Cooking, millet, raisin, Tempeh, Vegan on 11/12/2010 by Leslie Cerier.